A few years ago, the Walloon public broadcaster aired a breaking news item, on the occasion of the 1st of April, announcing Flanders had declared its independence. The reactions to this fictional news item varied greatly: while some viewers were outraged, others were panicking and internationally, not all media outlets understood the joke. Since 2007, when international media were covering the elections and the subsequent struggle to form a government and get out of the political padlock, the end of this tiny country has been the focus in many discussions. Belgium seemed unable to resolve its disputes and lost a lot of international confidence. To make things worse, the Flemish Liberal Party (Open VLD), after months of unsuccessful negotiations, stepped out of the federal government, causing its fall early this year. At exactly the moment that Belgium became president of the European Union and needs to help Europe find a solution for the deep economic crisis it is facing, the country is struggling, yet again, to assemble its own government. And with the surprising victory of the NVA, the New Flemish Alliance, could this be the end of Belgium as we know it? Belgium is divided into linguistic areas. If we exclude the German-speaking area for a moment, we can say that the North (Flanders) is unilingual Dutch, the South (Wallonia) unilingual French and the capital, Brussels, bilingual. The country consists of 10 provinces, which also form the constituencies, with one exception: Flemish-Brabant. This province, part of the Flemish linguistic area, has been split into two constituencies, Leuven and Brussels-Halle-Vilvoorde (B-H-V). B-H-V consists of the capital Brussels and its agglomeration, grouped under the name Halle-Vilvoorde (H-V). As Brussels is bilingual, many of the inhabitants in the surrounding H-V area speak French. Francophones in both Brussels and H-V are allowed to vote for Francophone parties from Wallonia and Brussels, despite the fact that H-V is unilingual Dutch. 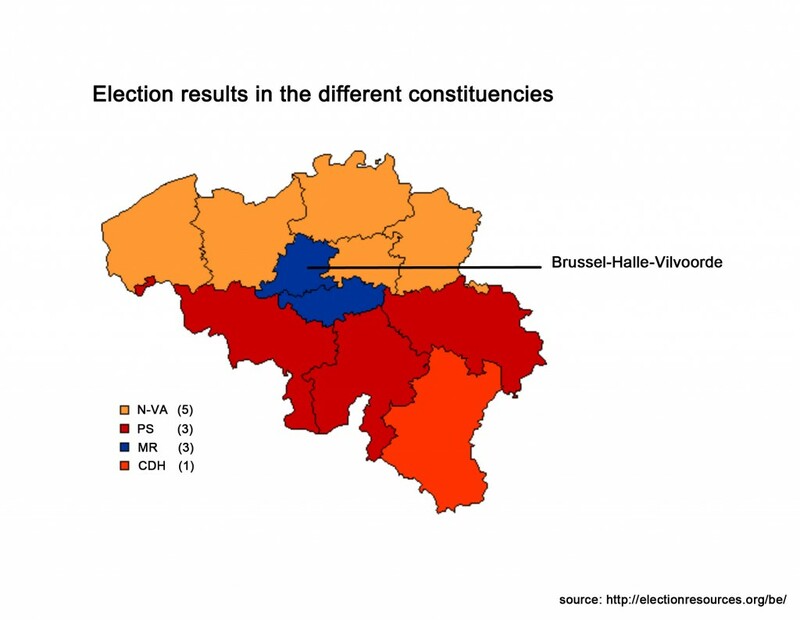 The other way around is impossible: Flemish parties that stand for election in B-H-V cannot get votes across the linguistic border for their list. In the fifties, Wallonia was renown for its thriving mining and steel industry. As this industry did not modernize its infrastructure adequately, it lost its ability to compete at an international level, while Flanders’ industry was rising around the same time. During the last decennia unemployment and subsequently poverty in Wallonia have grown steadily and many Walloons have to be supported by social security, provided by the federal government of Belgium. The money for this is mainly provided by the Flemish industry and Flanders’ taxpayers. The Flemish part of the country is growing tired of this one-way sponsorship, while Wallonia does not seem to want to change the current situation: it is neither able to provide the social security its inhabitants need, with unemployment rates twice as high as the national average, nor to improve their weak economy. Belgium has been struggling for years to find an agreement on these issues, which is a prerequisite for many parties to even start talking about other issues. These problems can only be resolved by changing the constitution, which requires a two thirds majority in the Senate and the Chamber of Representatives; this majority also only counts if it consists of a majority in both linguistic communities. The search for an agreement on these topics has paralyzed Belgian politics and put governing the nation on hold, exacerbating problems such as the growing national economic deficit. Earlier this year, the Flemish Liberal party decided to step out of the coalition, causing the government to fall and new elections to be held earlier than anticipated. This action added to the voters’ frustration about the political mess. Combining all these elements, one should have noticed the signs of the „tsunami“ that was about to hit Belgium. Many Flemish voters sought refuge to the one party that had been criticizing this situation all along: the New Flemish Alliance (NVA). This center-right oriented party, which only held a few seats in the Senate or the Chamber of Representatives until now, won the elections in Flanders with nearly 30% of the votes. In Wallonia, almost 40% of the voters have put their hopes in the the Socialist Party (PS). And still, the outcome of these elections was a wake-up call for everybody. The floodwave changed the political landscape completely and left a lot of casualties behind in every political party including budget cuts and resigning politicians. The two parts of the country have spoken with a clear voice and it is more obvious than ever that Belgian people live in a country with two completely different democracies, two different cultures and two different opinions. The presidents of both parties embody what the different linguistic communities feel the other one stands for: Bart De Wever (president of the NVA) sees nationalism and separatism as the solution to the current chaos and represents a Flemish part that is clearly in search of its identity; Elio Di Rupo (president of the PS) on the other hand embodies the kind of socialism the Flemish voters dislike, the long-term social security and support, which they perceive as the opposite of change and progress. The international media often describes the NVA as a separatist party, with its only goal being Flemish independence. There is no denying that their programme reflects this idea, Bart De Wever claims he does not strive for complete independence at this stage. In the run-up to the elections, he clearly stated that his first priority is to find a solution for the problems that paralyze Belgium and at a later stage consider how Flanders can gain greater independence. Looking for a solution all political players are likely to support is probably the smartest move. He might have won the battle around the elections, but hasn’t won the war yet. With such a strong political voice in each part of the country, asking for the exact opposite, a solution seems very hard to find. However, both parties seem to realize that a profound change is necessary and that these elections could very well be the last opportunity. The extreme right party as an example lost a tremendous amount of voters to the NVA, a sign that Belgians are not asking for the end of Belgium as a country as we know it, but are giving the politicians a final chance to work it out. As long as Belgians are looking for a compromise, they are still looking for a solution as one country. With one strong voice on each side, a two thirds majority – necessary for the constitutional changes needed to stabilize Belgium – seems much more possible than with a large number of political voices that are in complete disarray. The parties now face the challenge of finding a compromise. The NVA will have to prove that its main goal is indeed bringing back stability to Belgium and not only striving for Flemish independence. The PS on the other hand will have to show that they want to move forward and have understood that Flanders is asking for change in order to be willing to keep negotiating in the future. There is more at stake than just securing a victory in the next elections. The Tsunami has left many casualties and changed the political landscape completely. It is too early to say how Belgium will recover, but whatever the outcome of the ongoing negotations will be, it will define the future of Belgium. “Historical” is a word that is used much too often, but there is no other word that better emphasizes the importance of this situation.